Treasure Nile Progressive Jackpot Slot Guide & Review - Casino Answers! 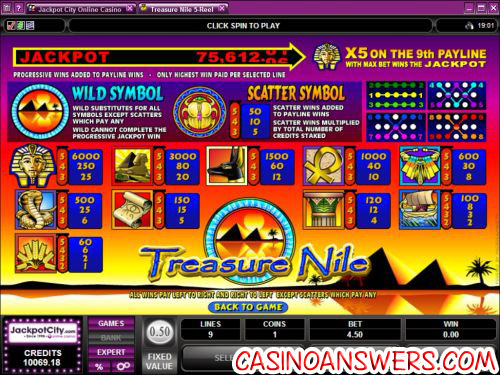 Treasure Nile is a 5-reel, 9-line progressive jackpot slot with wild and scatter symbols. Developed by Microgaming, you can play Treasure Nile at All Jackpots Casino and Lucky Nugget Casino. Treasure Nile is a progressive jackpot video slot with an Ancient Egyptian theme. The game gets its name from all of the treasures that were buried with the ancient kings of Egypt and the fact that the Nile River goes right through Egypt. The progressive slot uses several different symbols to represent both the Egypt and Nile part of the theme. When you start the Treasure Nile progressive jackpot slot, an intro video will play. In the video, the sun will rise over the pyramids and hieroglyphic symbols will appear, apparently unlocking a treasure. Treasure Nile has a fixed coin value of $0.50. The only setting you have to select in Treasure Nile is the number of line you wish to play. Casino Answers strongly recommends you play all nine paylines on the Treasure Nile slot machine, as that is the only way to be eligible for the Treasure Nile Progressive Jackpot. If you’re not playing Treasure Nile for its substantial progressive jackpot, you might as well play another Egyptian-themed slot at Microgaming, such as Pharaoh’s Fortune. To play all nine paylines, use the “Bet Max” button and you will spin the reels. The maximum bet in Treasure Nile is $4.50. To win the Treasure Nile Progressive Jackpot, you must have all nine lines selected and active. The winning combination that will win it for you is the Pharaoh symbol. You need to have five of these Pharaoh symbols on the ninth payline. The ninth payline in Treasure Nile goes from the bottom left to the top right. If five of these Pharaoh symbols appear on any other payline, you will win the 6000 top fixed jackpot. The Treasure Nile video slot’s wild symbol is the symbol with the pyramids along with the Nile in it. The wild symbol substitutes for all symbols except for the scatter symbol. The wild symbol does not pay out by itself and cannot complete a progressive jackpot win. Treasure Nile’s scatter symbol is the Scarab. Any scatter wins you receive will be multiplied by the total credits staked. The Treasure Nile Progressive Jackpot starts at a very sweet $40,000. The average hit is around $100,000, but it has been known to hit well over $500,000. At the time of this writing, the Treasure Nile jackpot is at over $75,000. Remember, the only way to win the progressive jackpot on the Treasure Nile slot machine is to spin with the maximum bet. If you are the type of player that dreams of winning that gigantic progressive jackpot and doesn’t mind shelling out $4.50 to try and make that dream come true, you should give Treasure Nile a try. As a standalone video slot, we think there are much better choices than Treasure Nile, if only because most progressive jackpot slots are targetted towards jackpot players. Treasure Nile does not have any special features like a bonus game or free spins, so really the slot is only for the players who are looking at hitting that progressive jackpot. For a shot at the Treasure Nile Progressive Jackpot and dozens of other progressive jackpots, sign up at All Jackpots Casino! How do I win the Treasure Nile progressive jackpot? To be eligible to win Treasure Nile’s progressive jackpot, you must have all nine paylines enabled. To make sure of this, use the “Bet Max” button. Each spin at the maximum bet will cost you $4.50. 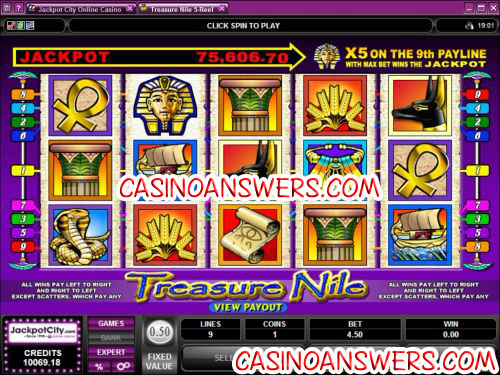 5 Pharaoh symbols must appear on line 9 of Treasure Nile to trigger the progressive jackpot. Are US players able to play for the Treasure Nile progressive jackpot? No, Microgaming casinos are currently off-limits to players in the United States. For a US-friendly casino with many different progressive jackpots to choose from, please visit Bovada Casino. Can I play Treasure Nile for free? No, Microgaming casinos do not allow players to play their progressive jackpot slot machines for free. Are there any other Egyptian-themed progressive jackpots out there? Yes, Cryptologic has one called Cleo Queen of Egypt. You can play Cleo Queen of Egypt at Casino Joy. If you want to read more Egyptian-themed slot game reviews, please read our complete list of Egyptian slots. What is a good microgaming progressive jackpot slot machine? How much is the treasure nile progressive jackpot? How do I win the treasure nile progressive jackpot game?